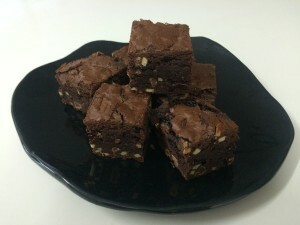 These cherry almond brownies benefit from a contrast between slightly sour dried cherries (Montmorency variety rather than the the sweeter Bing cherries) and dark chocolate, paired with the crunch of slivered almonds. 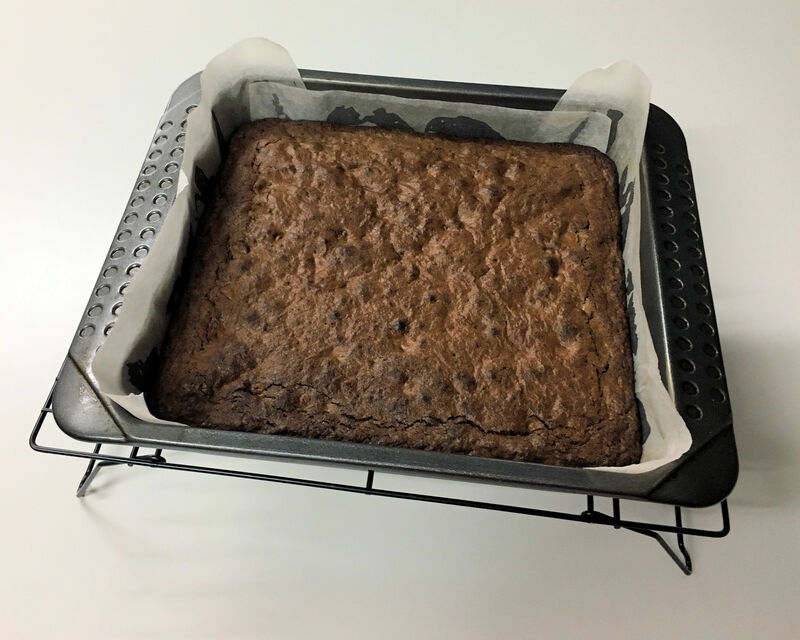 The flavour develops beautifully over a few days after baking. Dried cherries can be a little hard to source, but can generally be bought here. It is worth using cooking chocolate with a high (>70%) cocoa content for richer flavour. Pre-heat oven to 180 °C (fan-forced). Break up cooking chocolate into squares and chop butter into cubes. Place both in a glass bowl over a saucepan of water, but do not let the water contact the bowl. Heat on stove top using a medium setting until the butter and chocolate are just melted, mixing together as they melt (*). Allow mixture to cool for a few minutes. Beat eggs with vanilla bean paste, then add to butter-chocolate mixture. Whisk until smooth then add to flour, caster sugar, baking powder, salt, chocolate chips, dried cherries and slivered almonds in a large bowl. Mix until just combined, then transfer mixture to a greased, paper-lined tin (25 × 25 cm). Bake 50-55 min or until a skewer inserted in the centre comes out clean. Let cool in tin overnight before cutting. (*) If you overheat the butter and chocolate, you may see curdling, but even if this happens, all is not lost—you can regenerate a smooth mixture by beating well with the eggs in the next step. Just be sure to let the mixture cool first, so it doesn’t cook the eggs. If you have a mint plant (ideally, the variety known as chocolate mint) growing at home, this is a delicious way to use the leaves. By blending the leaves to a paste with coconut oil, you can make a “mint pesto” for incorporation into brownies or other baked goods. If you want to use the pesto on ice cream or similar, you can sweeten it by blending in icing sugar to taste, but the brownie mix is sweet enough to not require that. Pre-heat oven to 180 °C (fan-forced). In a coffee grinder or small food processor, blend mint leaves and coconut oil to a smooth paste. Break up cooking chocolate into squares and chop butter into cubes. Place both in a glass bowl over a saucepan of water. Heat on stove top using a medium setting until the butter and chocolate are just melted, mixing them as they melt. Stir in mint mixture until blended through. Remove chocolate mix from heat and allow to cool for a few minutes. Beat eggs with vanilla bean paste, then add to chocolate mix. Whisk until smooth then add to flour, caster sugar, baking powder, salt, chocolate chips and coconut flakes in a large bowl. Mix until just combined, then transfer mixture to a greased, paper-lined tin (25 × 25 cm). Bake 50-55 min or until a skewer inserted in the centre comes out clean. Let cool in tin overnight before cutting.